Family 3 will be a double plus a rollaway bed. Children in this family accomodation must be 15 or under. Hilton hotel was perfect for the night before our flight. Enjoyed an excellent meal in the evening. Parking the car was easy then the bus takes you directly to the terminal, you walk through the terminal back to the hotel lobby. Perfect. All good, one little complaint. We thought we were lucky when we were in Parking Zone B as most other times we have used the Long Stay Parking at the South Terminal at Gatwick we always seem to be in either G or H. Meaning we are always last off of the bus. This time we thought great, we will be one of the first off of the very packed bus. Unfortunately, after dropping people off at A the driver then decided to go to H and work backwards! Why, perhaps you might know why he decided to go backwards around the car park and we were still the last to be dropped off!!! This was the second time we had used the gatwick parking and Hilton hotel package. It is very good value for money and would definitely use it again. A good hotel, easily found on the directions supplied. The major problem was a mistake, by us, we needed a hotel closer to the North Terminal. Lesson learned! Another problem was booking in. The queue to book in was huge. At least 20 minutes waiting, some desks unmanned, everyone helpful but not enough staff to cope. Parking good, directions good and access good. Details of what to do on return vague but not unsurmountable. Overall good value for money. We have stayed in this hotel before and it is great value for money with excellent restaurants. Parking was easy and hotel was good apart from the air conditioning in the room which was very noisy. Like that it was on airport and just had to walk to the terminal for flight. Would use this service again but hopefully with a different room with less noise. 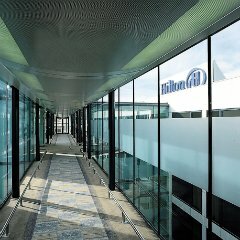 The Gatwick Hilton is perfectly located for early morning check in with just a short walk from the hotel to the airport all of which is covered. We paid for the buffet breakfast at the Hilton and were very satisfied. The room was adequate, importantly having immaculately clean linens, unfortunately the carpets and some upholstery were were somewhat stained but I guess that is inevitable in a hotel that is catering for high volumes of overnight stays. The parking arrangements with the Gatwick Long Stay car park worked well with the voucher issued by the Hilton only taking minutes to process on our return. Excellent, very clean room, polite staff, quiet considering the hotel is on the airport. Well organized Efficient Easy to book All in all a fantastic service which I would heartily recommend to anyone. Easy to find hotel, quick check in and very helpful staff. Convenient car park, and a very efficient bus service back to the car park on our return to the UK. Would certainly use again when flying from Gatwick. Hilton park and stay the night prior to flying makes for a good start to the holiday. The booking was satisfactory other than when I booked the hotel and parking package, the parking was claimed to be in the multi-storey next to the Hilton hotel at Gatwick airport. That was the reason that I specifucaly chose that package, as I was recovering from a major operation and would have difficulty pulling cases a long distance. However, at check-in, I was told that I'd been given a space in the long stay car park further across the site. This caused me considerable discomfort. 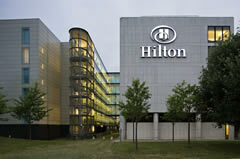 perfect location for Gatwick south terminal and everything you would expect from a Hilton hotel. My only reason for dropping one star is that parking is off site and not at the hotel. Whilst that is not a huge inconvenience, for the price I paid it would certainly have been better on site. It is also a fair walk to the terminal from the hotel but certainly better than relying on transfers. The whole experience was good. We were expected and the car parking known about. Family's of 5 will be in two interconnecting rooms, a double and a twin bedded room, plus a rollaway bed. Family 3 will be a double plus a rollaway bed. Children in family accomodation must be 15 or under. What is the latest time I can book in at the hotel? My flight doesn't land until midnight.The hotel will hold the room open all night for you. Once you have made the booking, please email us with the booking reference number so we can advise the hotel in advance.